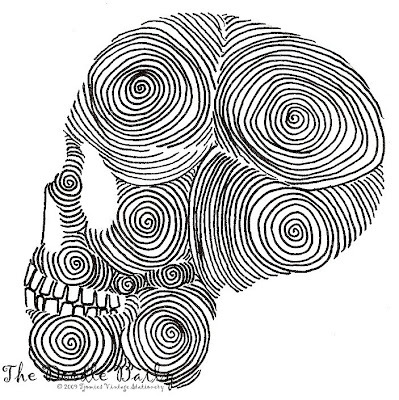 Just have to give a shout out to Warren at The Doodle Daily, who was inspired by Skull-A-Day to start his project, and just completed his 365th doodle today! It looks like he's not stopping at one year either, so definitely keep an eye on his blog for more doodles in the future. It must be pretty flattering to know you've inspired so many people to do their own 365 projects! It really just makes me happy to know that my project is encouraging people to have their own creative experiences. You really can't ask for more as an artist! Thanks for the mention and the vote of encouragement. Skull-a-day was a big inspiration for me and being able to contribute and be recognized on your site was such a pleasure. This has been a really satisfying experience and I'm not stopping anytime soon. How could I let the Doodle Fans down. I need to work on a new Skull Doodle (Skoodle) to keep the collaborative effort alive.